Enless Soft - Joomla! Extensions - Title Manager - F.A.Q. Enless Soft Products Joomla! Extensions Title Manager F.A.Q. Is page title so important? Joomla already sets a title for my pages. Isn't that enough? What is Advanced Title Manager? I created my own component for Joomla. Can I/or my customers/ use Advanced Title Manager to display titles for this very component? When do I need Advanced Title Manager? Is it possible to use different title patterns for different parts of my web site? Q: Is page title so important? Page titles are used by search engines to determine what the page is about. Titles are not the only thing in consideration, but they matter. Apart from search engine optimization, your site will have a more professional look when using the appropriate page titles. Q: Joomla already sets a title for my pages. Isn't that enough? It depends on your needs. Joomla has a default behaviour for creating titles. Some components have their own way of assembling a title. Others don't deal with titles. If you are happy with your pages' titles just the way they are than you don't need Advanced Title Manager. Q: What is Advanced Title Manager? 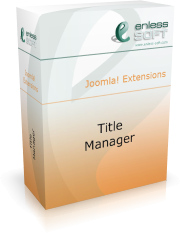 Advanced Title Manger is a native Joomla 1.5 extension that allows you to control the title of your web pages. Q: I created my own component for Joomla. Can I/or my customers/ use Advanced Title Manager to display titles for this very component? Yes, you can. This is one of the best things you get - you have a title management system that is not bound to a list of supported components. Even better, Advanced Title Manager is easily extendable, giving you the ability to provide users of your component with predefined title items. Q: When do I need Advanced Title Manager? You need it when you have a Joomla-based web site and you want to have control over titles displayed for your pages. Q: Is it possible to use different title patterns for different parts of my web site? Yes. There are two options for achieving that. If you have the Advanced Contexts Manager extension, you could bind a pattern to one or more contexts. If you don’t have this extension you could use strict patterns to achieve similar results.